If there’s one thing we’ve learned from history, it’s that trends come and go. We don’t have to look much further than hairstyles and fashion to know this to be true. From rats tails to skinny jeans, trends have come, and most have gone. The same can be said about graphic design and web design trends. Here’s how your brand can tell which trends to follow, and when to leave a bad fad alone. A Coca-Cola ad from the 1950s looks vastly different than an advertisement from the 80s, 90s, or today. That’s because as a society, our culture changes, our tastes change, and design, fashion, and lifestyle all change in sync. So, as a company, when considering your brand strategy, do you need to constantly keep changing along with society? Not necessarily. There’s nothing wrong with standing your ground, or standing out, for that matter. Sometimes trends come back around; retro designs and hand lettering, for example, are quite popular at the moment. This design trend pays homage to the days before computers, when graphic design was sitting down with a paintbrush or etching a stone lithograph for a limited run of poster prints. When computers came into the mix, not many people were using hand painted designs. Think of 80s print advertising: we had big dreams for a bright future with hoverboards and silver jumpsuits. We liked our print advertising neon and loud. The 90s rolled around and we slowly started to feel embarrassed for our 80s trends. But it’s been long enough now that bright, bold, and even neon designs are in again. A perfect example is Memphis Milano and the rise of millennial pink. Simply put, trends change. Some come back, some die off, and some we just wish we could forget completely. So, what should you do as a brand when it comes to design trends? The ability to be fluid as a brand lets you keep up with the latest trends, always stay relevant, and constantly reinvent yourself. 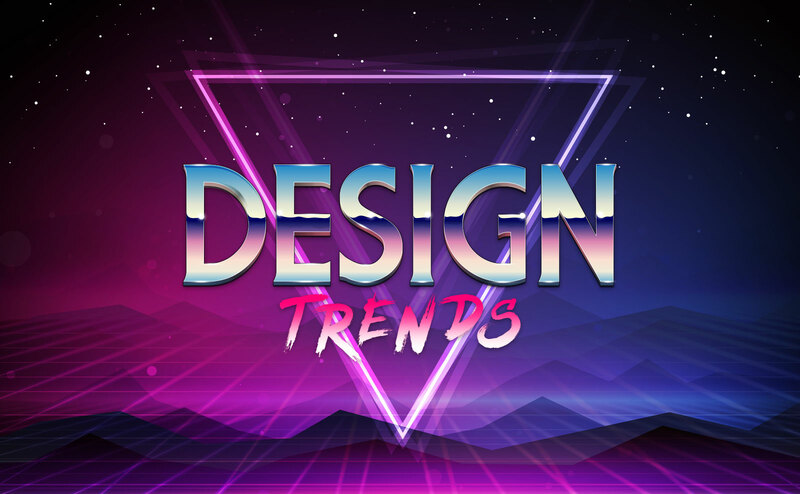 When something new is trending in the design world, you can jump on board and incorporate them into your designs. Being a fluid brand keeps you fresh, hip, and well…trendy. Fluidity allows for endless possibilities, but is it right for your brand to always be doing the next big thing in design trends? If you’re going to be fluid, know the right trends to jump on, and know which to avoid. WHO’S DOING IT RIGHT: Warby Parker. They are constantly reinventing not only their products, but their marketing materials and web content to reflect what’s in. There’s absolutely nothing wrong with going against the grain when it comes to design. Doing your own thing will help you stand out from the crowd. Maybe this approach isn’t right for every brand, but it’s certainly a good choice for some. Just be mindful of which direction you choose. Some design approaches can be poorly received, and some are just plain bad. Keep in mind that trends are trends for a reason. If you’re going to go your own way, make sure it’s in a good direction. WHO’S DOING IT RIGHT: Apple. Not only do they go their own way when it comes to design, but they are often emulated by other brands. If you like the way your brand is represented, why change it? For some brands, there really isn’t a reason to jump on any bandwagons. Some companies do their own thing, and do it successfully. Some even luck out, and what they’ve been doing for years is suddenly in. If hipsters have taught us anything, it’s that some things can be so bad, that they’re actually good. If you’re going to stand your ground, make sure it’s ground worth standing upon. WHO’S DOING IT RIGHT: La Croix. They didn’t design their cans to meet the design trends of today, but are wholeheartedly embraced by a sea of devoted fans. As a creative agency, we keep a close eye on design trends. The design world is a fickle and cruel mistress. What’s hip today is played out and tired tomorrow. So, is keeping up with what’s in for the moment even worth it? The short answer is, that’s up to you. Need a second opinion? We’re here to help.